Officials have installed 108 computerized lockers in West Hall over the last month, allowing students to punch in a code and pick up packages anytime the building is open. Students living on the Mount Vernon Campus can now skip the line at package services. Officials have been working over the last month to install 108 computerized lockers in West Hall, next to Pelham Commons, allowing students to punch in a code and pick up packages anytime the building is open. Students said the new technology will offer an easier and more accessible way to pick up their items, since package services is open less frequently on the Mount Vernon Campus compared to Foggy Bottom. “The Mount Vernon Campus is an ideal location to pilot this technology given the lower package volume at the campus and more manageable logistics,” Knight said in an email. Officials will monitor the program during the spring semester and will reach out to users to get feedback on the lockers, she said. Knight said if the lockers are successful, officials could eventually bring the technology to the Foggy Bottom Campus. She declined to say how much it cost to install the lockers. The system works similarly to the one used by the online retail giant Amazon for its locker delivery program, which was installed in Whole Foods in Foggy Bottom last fall. When a student receives a package and it’s placed in a smart locker, they are emailed or texted a pin which they punch in on a touch screen to open the locker. Students may still have to go to the package services center, located in the West Hall parking garage, if the package is too large to fit in a locker or if all lockers are full, according to an email sent to campus residents Tuesday. 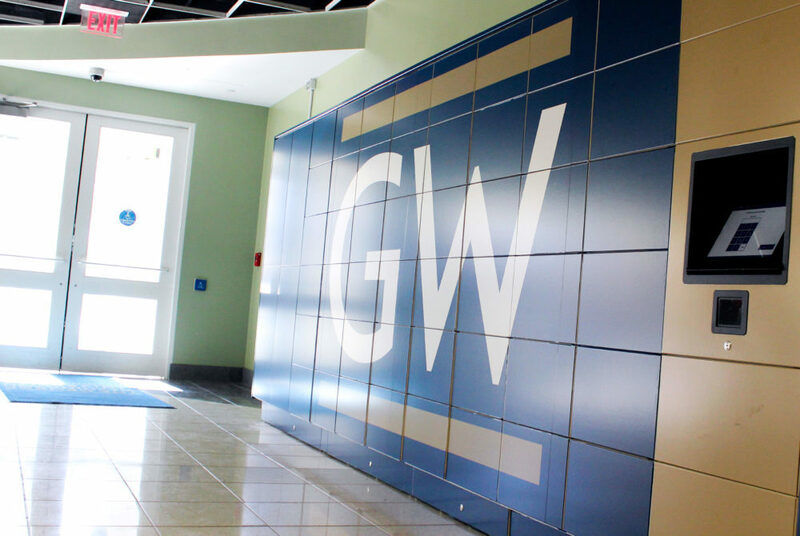 Dan Flack, the vice president of the Americas for TZ Limited, the company that created and installed the lockers, said GW has been exploring the installation of the digitalized lockers for about two or three years to find a better way to deliver packages to students living on campus. He said officials came to an agreement with the company to install the lockers in October, and the installation of the lockers, which mostly occurred over winter break, took about eight to 10 weeks. He said the lockers were placed in West in four sizes – extra-small, small, medium and large – to accommodate differently sized packages. The lockers are roughly two feet deep, Flack said. Students who live on the Vern said the lockers will make retrieving packages an easier and faster process, because the campus’ package services is open fewer hours than Foggy Bottom’s and can take longer to process packages. Mary Oehler, a freshman who lives in West Hall, said she hasn’t tried out the lockers yet but will likely use them when she receives packages about once a month from family. Package services on the Vern is open Monday through Friday 11 a.m. to 6 p.m. and Saturday from 10 a.m. to 2 p.m. The location is closed on Sundays. On the Foggy Bottom Campus, package services is open from 8 a.m. to 8 p.m. Monday through Friday and noon to 6 p.m. on the weekends. Caitlin Harrington, a freshman who lives in Somers Hall, said she used the lockers for the first time Thursday to retrieve textbooks.